Why do my Flutes Sound Thin and Squeaky in the Third Octave? It is no secret that band flute players struggle with sounding thin, shrill, sharp and squeaky in the third octave. Knowing alternate fingerings to correct pitch can help, but won’t entirely solve the problem. What do you need to know to help them overcome these tendencies? The answers lie in what you can show your students regarding embouchure, air speed and a supported air column. “Looser lower, tighter higher” is a myth with regard to flute embouchure. A close corollary is “warm air low, cold air high”. Neither is correct or even accurate. How it really works is that basically the size of the aperture is pretty consistent from octave to octave. What is changing is how the air is being directed, higher or lower, with the lips moving independently of each other. Reach with your top lip to blow down more in lower octave or playing forte, push the bottom lip more forward to raise air stream to go up the octave and correct flatness when playing softly. Place the flute lower on the chin and open the blow hole slightly. No more than a third of the blow hole should be covered by the bottom lip. This increases the transit time (the time from which the air exits the lips to when the air strikes the blowing edge), which increases resonance and depth of tone. 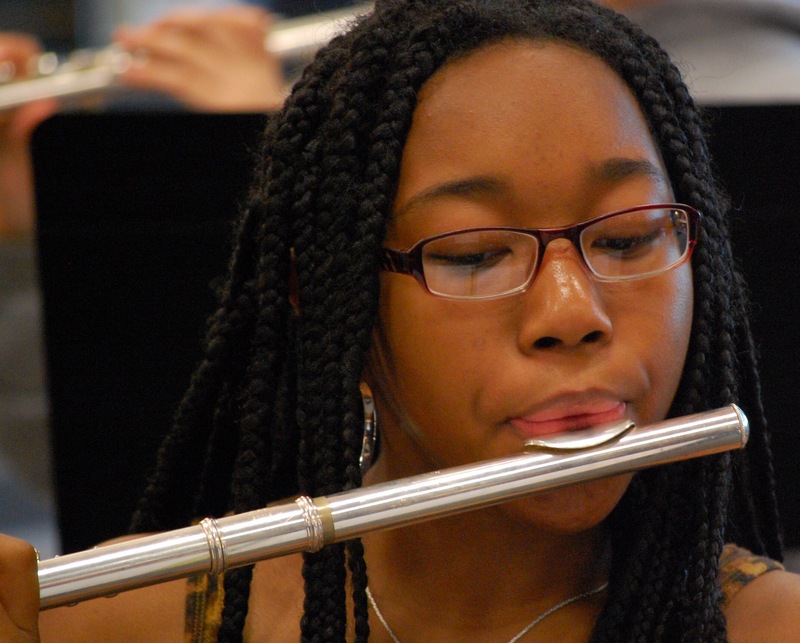 To create an open resonant tone in all octaves is the most compelling reason why you want to teach students to bring the flute up into place on their chin rather than the old “kiss and roll” method. The “kiss and roll” places the flute too high on the lip, with a small, thin, shrill sound being the result. BLOW, doggone it! Let me qualify this….there is a big difference between the quantity of air and the speed of the air. The quantity of air has to do with dynamics. On the other hand, the speed of the air is pretty consistent in all registers and at any dynamic level. The speed of the air is controlled by our supporting muscles (abdominals and muscles of the pelvic floor). Providing the supporting muscles are driving the air column, one can maintain an open, clear sound in any octave or at any dynamic. Students often think they can “support” their sound with their lips. They pinch or bite down on the aperture, clench their teeth or close their throat rather than use their supporting muscles. Think of how a garden hose works. The actual water pressure come from pumps that are far removed from the nozzle of the hose. The nozzle is responsible for directing the water wherever it is needed. If you close down the nozzle most of the way, the water sprays out in a wide pattern. If you open the nozzle most of the way, you get a strong directed stream of water because of the force of the water pressure. Bottom line? The basis of good tone in the third octave is based on developing a good tone in the other two octaves. You can’t really separate the third octave out as a separate entity. If you have a strong, supported tone in the lower octaves, you will have an open, clear and supported sound in the third octave as well.